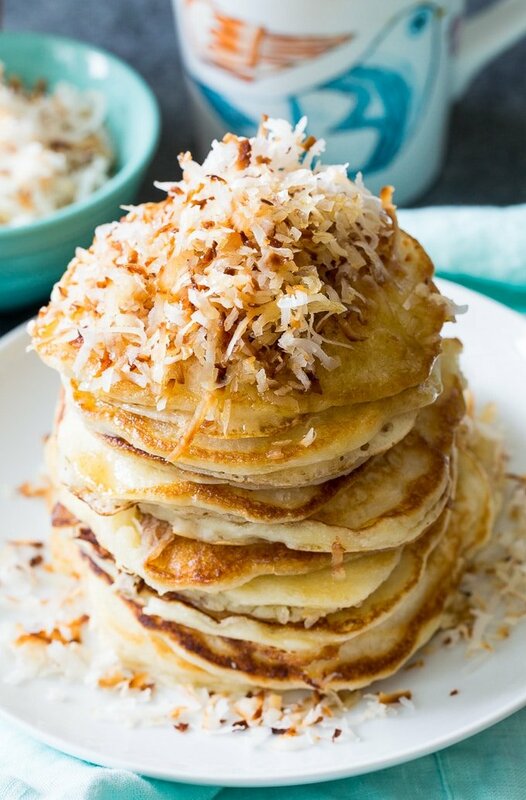 Coconut Pancakes are made with coconut milk and shredded coconut for lots of coconut flavor. Top them with a little toasted coconut for a wonderful breakfast or brunch recipe. Pancakes are my absolute favorite for breakfast and I love trying different variations. Scroll down to find more pancake recipes above the recipe box. The batter for these Coconut Pancakes is on the thin side because there is so much liquid in it, but these pancakes cook up so delicious. Be sure they have cooked enough before flipping them them and they will hold their shape just fine. 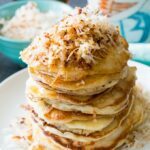 Finish these Coconut Pancakes off with some maple syrup, butter, or whipped cream, and maybe even a few fresh berries. 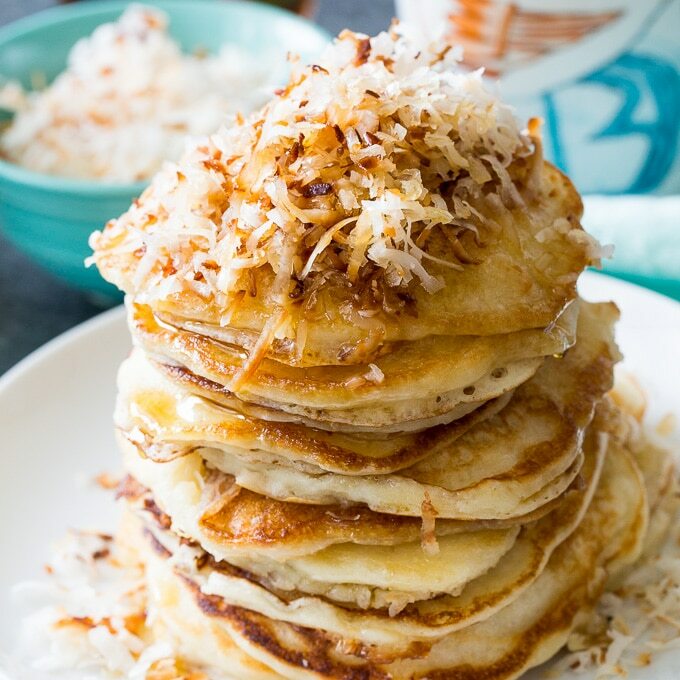 For even more coconut flavor, cook the pancakes in coconut oil. Or just use vegetable oil. 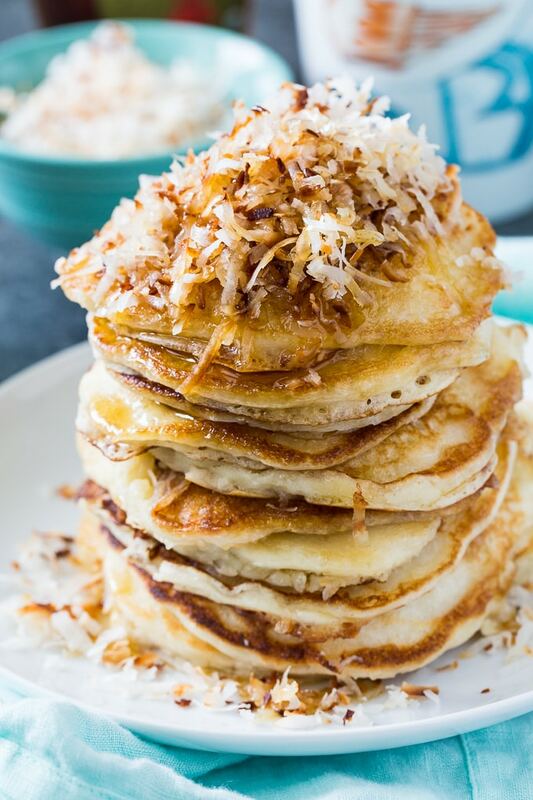 A batch of Coconut Pancakes will bring a tropical feel to your morning! In a medium bowl, whisk together buttermilk, coconut milk, egg, and vanilla extract until mixed well. Add wet ingredients to dry, stirring just until all of the flour is moistened. Stir in 1 cup of coconut. Place remaining coconut in a small nonstick pan and heat over medium heat, stirring frequently, until toasted. Heat a griddle over medium heat. Coat griddle with a little oil and use a 1/3 cup measuring cup to drop batter onto griddle. Cook until bubbles form in center and flip over. Cook another 1 to 2 minutes. Coat griddle with more oil for each batch. Serve topped with toasted coconut and maple syrup. This entry was posted in Breakfast and tagged coconut, pancakes. Bookmark the permalink. I love your website. The recipes are clearly explained with accurate measurements. This recipe adds a nice touch to our regular pancakes making them more interesting.